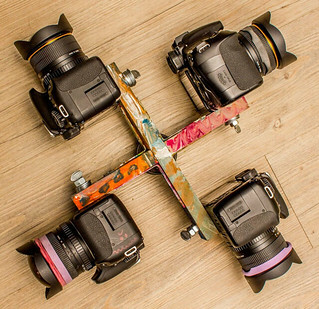 Photographer Vincent Brady made a contraption with four cameras, each fitted with fish-eye lenses, which he set up to do 360-degree panoramas. He calls them “Planetary Panoramas” and the results are amazing! While experimenting with different photography tricks and techniques back in 2012, I was shooting 360 degree panoramas in the daytime and long exposures of the stars streaking in the sky at night. It suddenly became clear that the potential to combine the two techniques could be a trip! Since the Earth is rotating at a steady 1,040 mph I created a custom rig of 4 cameras with fisheye lenses to capture the entire night-sky in motion. Thus the images show the stars rotating around the north star as well as the effect of the southern pole as well and a 360 degree panorama of the scene on Earth. Each camera is doing nonstop long exposures, typically about 1 minute consecutively for the life of the camera battery. Usually about 3 hours. I then made a script to stitch all the thousands of these panoramas into this time-lapse. I created my rig in January of 2013 while in my final semester at Lansing Community College before receiving an associates degree in photography. Given it was winter in Michigan, I didn’t get to chase the notorious clear moonless night sky as much as I had hoped as the region has lots of cloud cover that time of year. Though I was ready on the rare night to go experiment. After graduating in May I had built up quite the urge to hit the road. My rig has taken me to firefly parties in Missouri, dark eerie nights at Devils Tower, through Logan Pass at Glacier National Park, up the mountains of British Columbia, and around the amazing arches and sandstone monuments in the Great American Southwest. These are the images I created on the cold, dark, sleepless nights under awe-spiring skies. The music is composed and recorded by my very good friend, the acoustic fingerpicking guitar prodigy Brandon McCoy! Brandon who is also from the greater Lansing area in Mid-Michigan is quite the acoustic instrumentalist. The song chosen for this time-lapse is called ‘One Letter From Lady.’ I moved to Michigan when I was 15 and Brandon was the first friend I made. He was the cool kid playing Pink Floyd licks on a $2 guitar at the time. Soon, after he had spent his cold, dark, sleepless nights perfecting his craft, he started coming up with his very own instrumentals. Some of which are upbeat by mixing picking, slapping, and drumming on the guitar while other compositions of his are calm and soothing and can put you in a meditative trance if you just close your eyes. It has been a great experience watching each other grow as artist for over the past 10 years, and you better believe we will be collaborating on projects like this in the very near future. First are the weird star trails you see in many of the scenes. I’ve explained this before, but briefly: When you face north, east is to your right and west to your left, so the stars rise and set in a counterclockwise manner. If you face south, the reverse is true (west on your right, east on your left, and the stars move clockwise). If you look due east, the stars rise straight up, going over you head. Face west, and they move straight down to the horizon. Normally, since you can only look in one direction at a time, you don’t have to deal with all these different movements all at once. But in the video we’re seeing the whole sky at the same time, with all those weird motions combined. So near the sky’s north pole the stars make little circles one way, and near the south pole (which is below the horizon in Michigan, where these shots were taken) they move the opposite way. But there’s more! Once the images are stitched together, they can be mapped into different shapes. Just like you can take a map of the Earth and turn that into a spherical globe, a flattened Mercator projection, or any number of other types of shapes, you can do that with the sky as well. Brady reshaped the pictures several ways in the video, including using a (more or less) flat horizon facing east (at the 0:15 mark), which makes the stars rise out of the middle of the frame, and the same thing but facing south (at the 1:55 mark) and west (at the 2:19 mark) — all of which make the sky look very odd indeed. But he also used something called the “Little Planet” effect, which is really weird. This takes the flat horizon and wraps it around into a circle, making the left side of the image touch the right, like rolling a rectangle up into a cylinder (or, more accurately a cone). The technique is pretty simple, and the end result is that it’s like you’re looking down on a tiny little planet or asteroid with the sky wrapped around it. This also tends to distort taller objects, lengthening them, so the arches (at the 0:30 mark) and hoodoos (at the 1:27 mark) look like they’re reaching toward you. I’ll note that this is the opposite of the “all-sky” effect (at the 1:14 mark) where it looks like you’re looking up into the entire sky. What fun! And all of this just from looking in all directions at once, and applying a little math to the result. I have to admit, I found it very disorienting (in a fun way) trying to pick out constellations and familiar landmarks in the sky during the video. This is really cool and I hope he registers a patent! This entry was posted on Monday, June 23rd, 2014 at 1:07 am	and is filed under Astronomy, Cool Stuff, Space Exploration. You can follow any responses to this entry through the RSS 2.0 feed. You can leave a response, or trackback from your own site.